We will be doing a ride and barbecue to celebrate the CORBA Trail Crew's completion of work on the Mount Zion Trail. This trail was in very poor shape, and had become completely overgrown until the CORBA Trail Crew stepped in and brought it back to life! 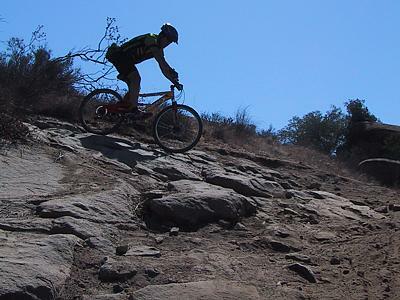 This will be a 10-mile loop on some of the most scenic trails in the Angeles National Forest. After the ride the good folks at the Chantry Pack Station will barbecue for us, with the food provided by CORBA! Non-MTB folks who worked on this trail with us and Forest Service personnel are welcome to join us too! You could do a hike and then join us for the barbecue, or just come up for the barbecue. Check the CORBA Trail Crew page on the Web site for meeting time and directions. Can you believe it is mid-January and we are having Red Flag Warnings? A Red Flag Warning means increased fire danger and the high possibility of a quickly spreading fire in the area within 24 hours. During Red Flag Warnings in the Santa Monica Mountains, the California Department of Parks and Recreation closes backcountry facilities. For more information and to see if your ride will be affected, call the California State Parks Fire Information Line for updates on fire closures for Point Mugu, Malibu Creek, Leo Carillo, Will Rogers, and Topanga State Parks at (805) 488-8147. The Orange County Wheelmen are working with State representatives to create a Share the Road novelty license plate. To view what it may look like, click www.bicyclecolorado.org . If approved, proceeds will go to educating motorists on how to safely share the road, educating bicyclists on the rules of the road and safe riding, educating event directors and bicyclists on best practices for event safety, providing guidance to bicyclists involved in crashes, and outreach to law enforcement on the rights and responsibilities of motorists and bicyclists. To support a California Share the Road license plate, please sign the online petition here: http://www.petitiononline.com/str1234/petition.html. Sundance Cycles presents Serotta Customer Appreciation Night and Demo Event February 3, 2007. Scheduled events include a group road ride through the Santa Monica Mountains, a ride with the guys from Serotta, a presentation by Ben Serotta, and a raffle for one of Serotta's all new HSG framesets. For the latest news and an up-to-the-minute event schedule for the Sundance Cycles Serotta Day, visit www.sundancecycles.com and view the events at www.serotta.com.